To establish order, the Vampire Federation is born, policed by special agents like vampire Alexandra Bishop, authorised to hunt down those who violate the new code. But rebel vampire Gabriel Stone doesn’t play by the rules and declares war against the Federation, throwing Alex and her team into turmoil. 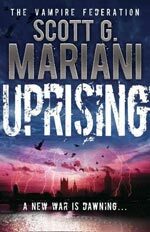 Uprising is the first novel in the new paranormal Vampire Federation thriller series by Scott G. Mariani for readers in the UK (or by Sean McCabe for readers in the US.) In a mess of nom de plumes and pseudonyms Sean McCabe, or Scott G. Mariani, are actually alternative names for British adventure thriller writer Scott Mariani who is the author of the bestselling Ben Hope thrillers. If you are a fan of the Ben Hope books then, fear not – you’re going to enjoy Uprising. It’s remarkably similar in terms of style, pacing and content to previous offerings from this author – only with vampires rather than ex-SAS soldiers and human bad guys. Uprising is a modern reworking of Bram Stoker’s classic novel Dracula but with most of the things that made it a classic taken out. We’re left with major plot points, which Dracula fans will have no trouble recognising. A sinister cargo that mysteriously arrives at England’s shores – its crew members missing, raving-mad or dead. Gabriel Stone plays the Dracula character; he’s a manipulative evil vampire, who has plans for expanding the area of his evil influence. He has some stunningly beautiful (and inherently evil) Brides and Finch, a creepy human henchman who he’s turned into a ghoul. 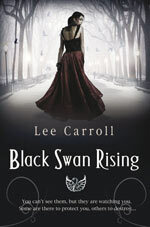 There’s a young local girl, who gets bitten and turns vampire (in the manner of Lucy) and a Transylvanian castle plus the mad dash of a vampire slayer across Europe. In addition to the reworked Dracula elements, Uprising gets a modern treatment with the addition of the Vampire Federation. This is the ruling body or governing force of “good” vampires. These vampires live by rules such as no killing, no making new vampires and no letting humans find out that vampires are real. They use conveniences of the modern world, such as drugs that allow them to go out in the daytime and bullets tipped with a chemical that is instant agonising death to all vampires. They are kind of vamp-lite and are obviously in opposition to non-Federation vampires who take the traditional view that vampires are the top of the food chain and should be allowed to do what they like. Along with the vampire politics the other new element to the story is the search for a lost relic with the power to kill any vampire that gets within a few feet of it. Where Uprising primarily falls noticeably short of Dracula is in its lack of character development, and to a lesser extent its lack of fantasy mythology world-building. The story’s fast pacing is able to pull readers past the lack of world-building but the characters are just sketchy – poorly fleshed out and mostly one-dimensional. As someone who enjoys character driven writing, I want to know all there is to know about the people in the story, how they ended up where they did and what motivated their actions. I want to understand the characters fully. This is impossible in Uprising since for the most part the characters act solely as a vehicle for the action-packed plotline. Joel Solomon, the story’s human protagonist, and Special Agent Alex Bishop, the vampire heroine, are given a little more fleshing out than the story’s other characters typically receive and this goes a long way to keeping the book readable. However, supporting characters are thinly drawn and this gives Uprising as a whole about as much depth as a shallow puddle. As an example of what I mean take Seymour Finch, the evil vampire’s ghoulish human servant. He plays a similar part to Renfield in Dracula. Yet Renfield always inspired pity along with revulsion (at least he did in me) as a reader I had some idea about how he came to go mad and become Dracula’s willing servant. Finch by comparison is thoroughly, unrepentantly evil. He’s a shifty, baby-eating, repulsive creature who readers know nothing about except that he’s obviously a BAD GUY and needs to be killed by our hero. Is character development really that important in a fast-paced modern thriller? Well, the book basically works and is okay without it but I can’t help but feel the story could have been amazing if it had been at least as much character driven as it was action driven. Still, for all my bitching I did find Uprising to be an undemanding, easy book to read. Fast plot pacing, snappy dialogue and no shortage of action go a long way to redeeming the whole story, and let’s face it Uprising has never claimed to be a work of literary genius. This entertaining vampire thriller is possibly perfect beach reading for anyone looking for a modern adventure thriller with an edge of vampire horror – and I mean that in a good way! For more information and to read a sample chapter from this book visit Scott Mariani’s website.